Myrtle Beach State Park campground has 204+ campsites for tents, trailers and RVs (up to 40 feet). There are 138 sites with electric and water; and 66 sites with full hookups. There are also 30 (overflow) tent-only campsites and cabins for rent. Our favorite Myrtle Beach State Park campsites are: 16, 17, 18, 60, 76, 118, 141, 194, 200 and 216. Myrtle Beach State Park is about 300 yards from the beach and has drinking water, flush toilets, hot showers, a laundromat and dump station. In addition the campground/park has wifi access, visitor center, gift shops, camp store, equestrian facilities and firewood is for sale from the campground host. Huntington Beach State Park is also close by – about 15 miles to the south. It has 139 campsites with water & electric hookups. 16, 17, 18, 60, 76, 118, 141, 194, 200, 216. Visted Myrtle Beach State Park Campground lately? We'd love to hear about your adventure. Did you find us useful? Did we forget something? 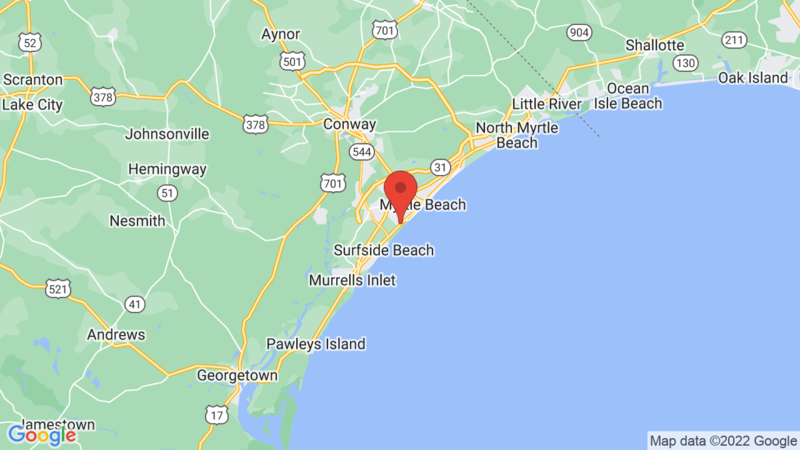 Anything our community should know before heading out to Myrtle Beach State Park? Stayed in Jan. of 2014. Quite a distance to the beach. Cool pier. Nice restrooms and laundry room. Nice sites. The park is very, VERY close to the airport. Wave to the folks flying. Probably a very convenient place to stay during the prime season. Just a little too loud and commercial for our tastes. Autumn camping on Myrtle Beach State Park sites numbers 73 and 75 could cost you thousands of dollars in property damage to your vehicle and RV. In October 2017, our Ford pick up truck was pelted by falling in hickory nuts causing 42 dents and $1800 in repair cost while tent camping on site number 73. Had we had our new trailer it to would have been dented by falling hickory nuts. Both site 73 and 75 both have hickory trees overhanging the sites. Hickory nuts fall every year and surely can damage vehicles and RVs on these sites. Since hickory nuts fall every year, avoid these two sites in the autumn.